Taste Tester and I spent a beautiful spring day wandering around Herald Square and wouldn’t you know it, we came across a little chocolate and peanut butter right on the street. We were quite full from breakfast but that didn’t stop us from sampling these cute cookie sandwiches from ‘wichcraft. 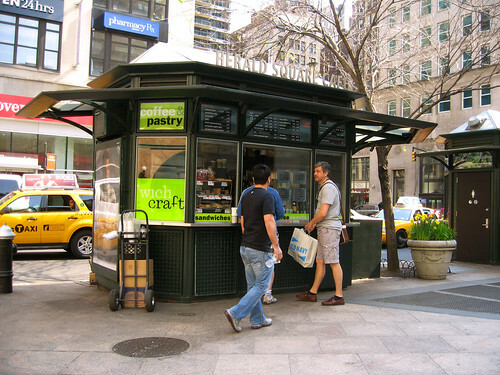 ‘wichcraft has multiple cafe locations as well as these convenient stands in various parks throughout the city. 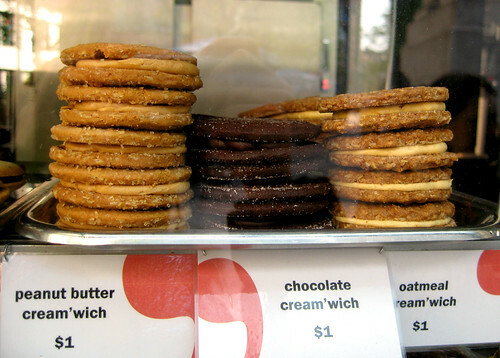 I have enjoyed a few savory sandwiches from ‘wichcraft but had never tasted their cookie sandwiches. Unfortunately I think these may be a touch overrated, but they were good enough for a sweets fix. Taste Tester liked the smooth peanut butter filling, but thought the oats in the peanut butter cookie made for an odd texture. The chocolate sandwich had a strong cocoa flavor with a fudgey dark chocolate frosting in the center. The tasty fillings helped but the cookies themselves were a little too dry and over-sugared. 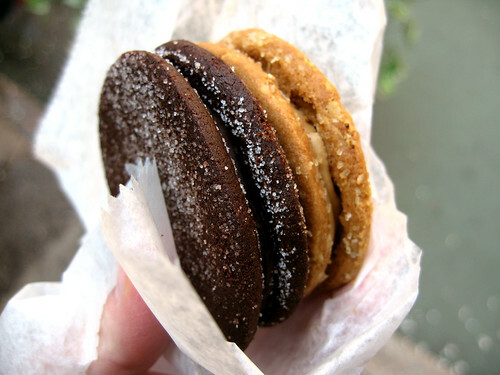 All in all, I would get them again if I were to pass by a ‘wichcraft but in a city with such stellar desserts (not to mention this delicious pb cookie sandwich), don’t know that I would seek them out. At the very least I really enjoy finally getting to taste items I read about on Serious Eats: New York. If you ever plan on visiting NYC you should definitely do some reading on their site for the latest must-haves in the nyc foodie world. Check it out, because how else will you know when someone opens up a shop that only sells meatballs?